418 customers have given this product a 5-star rating. Of these, 391 customers have written no texts or given their feedback in another language. 191 customers have given this product a 4-star rating. 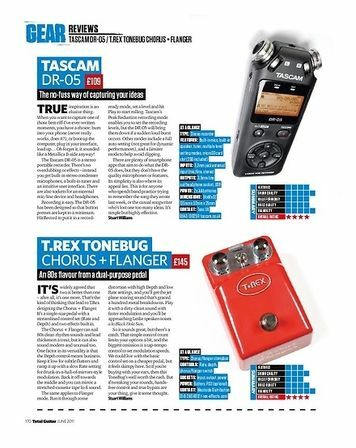 Very good sound for the price! 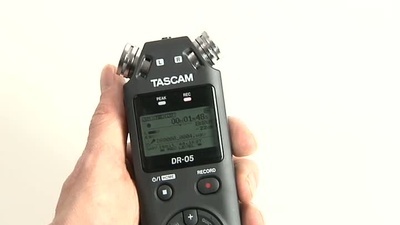 I got this to record sounds outdoors. I use sounds from nature that I edit into samples and create beats from. I specifically wanted omni mics. I needed something with decent sound and good battery capacity. I did not need lots of options or high sample rates, just simple 44.1 kHz 24bit recordings in a small package. -Very good sound, better than I expected for the price. -A decent set of features (like different sample rates, limiting, etc). More than I needed really. 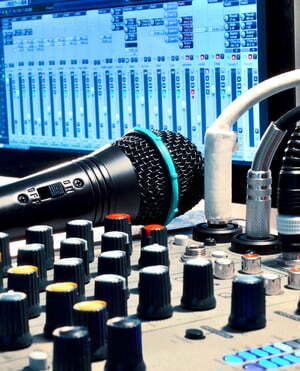 -Omni mics (perfect for my needs but might not suit all purposes). -Feels a bit toylike and fragile. Very "plastic". Not particularly weatherproof for a handheld recorder. Can't be used in rainy weather, that's for sure! -The menu layout feels a bit primitive and the names used for some of the functions aren't very intuitive. Very confusing. The basic functions are easy to use but the more advanced functions are very poorly laid out, confusingly named and almost impossible to understand without constantly referring to the manual. -Not sure what kind of wav-format it uses but it won't import into my daw in the same way normal wav files do. If I just drag the clips into my daw they don't drop where I want them to. They add minutes of space before the clips. It seems like they include some kind of time code (which they shouldn't). Very annoying!!! If I drop them into my wave editor instead it works fine. -The preamps are VERY noisy when cranked. So it doesn't really work for recording very quiet stuff. For "normal" recording levels it's fine. To sum it up: It has it's issues but for my needs and for the price I'm happy with it. The major selling point for me is the low price, the sound quality and the omni pattern. The omni pattern might not be the best choice for everyone though. 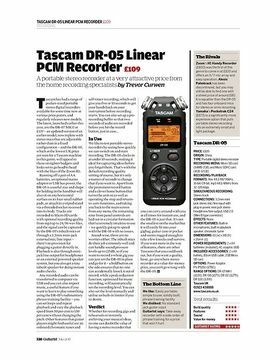 Recommended if you need a cheap omni handheld recorder. I practice in a small Blues Band every week and I used to use a mobile phone for recording our stuff for reference purposes. This proved very difficult and the standard of sound was poor. 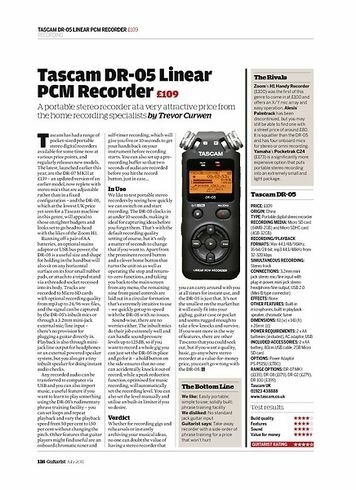 Then I saw this Tascam DR-05 V2 recorder plus a very strong and well fitting Thomann case for a ridiculously low price. I bought it and the band and I have never looked back. It is so easy to operate with no fiddly method of rewinding and the sound when played back through an amp is fantastic. We now record our complete evening's practice sessions and I am able to transfer them on my PC and wipe it clean ready for the next week. 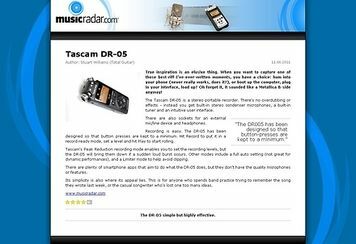 I tried to find faults with it to let customers know what they are buying but could not apart from the fact that you have to read the manual thoroughly to get the best of the recorder. 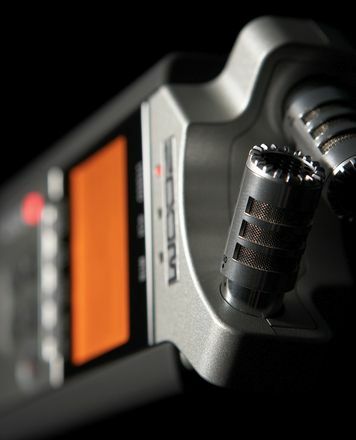 The batteries in my recorder are almost a year old now and still going strong. Great for recording a full gig also, as this will stand up anywhere in the front of the stage. So portable and the Thomann case keeps it very safe. 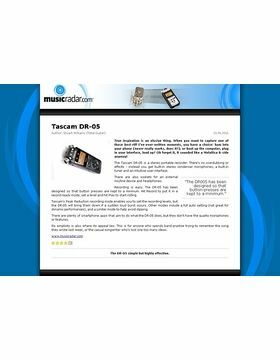 ID: 262604 © 1996–2019 Thomann GmbH Thomann loves you, because you rock!